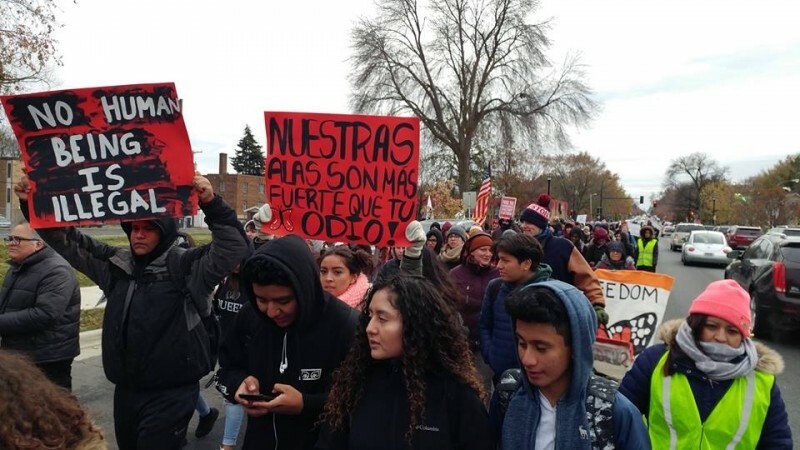 Minneapolis students walk out to defend DACA and TPS | Fight Back! Minneapolis, MN - On Nov. 10, around 500 students from 17 local high schools and middle schools walked out of their schools and braved cold weather and bitter winds as they took to the streets to demand that Congress take immediate action to protect hundreds of thousands of immigrant youth who will be stripped of their hard fought-for legal status. They converged at Martin Luther King, Jr. Park and marched over two miles to the memorial of Emiliano Zapata, symbolizing the unity of the struggles of Black and Latino students. During the march, rhythm and energy from local danzantes kept spirits high, as protesters chanted, “Donald Trump, shame on you! Immigrants are humans too!” and “We believe that we will win!” These determined youth, commonly referred to as “Dreamers,” have repeatedly marched without fear for the past decade and forced President Obama’s hand in implementing the program known as DACA – Deferred Action for Childhood Arrivals. President Trump’s announcement two months ago to end DACA was a continuation of the blatantly racist attacks against immigrants since Trump took office. Over 800,000 children and young adults again face the threat of losing the only home they have ever known. Most of them were brought here as infants or small children by parents escaping the dire economic conditions or wars and violence brought about by U.S. imperialism. And once again, these youths are taking to the streets to demand justice. The Friday, Nov. 10 walkout was organized by the Interracial Student Movement (ISM), a student group formed just three weeks ago. Angelica Bello, one of the main organizers, felt like she needed to take action. “I am affected by the system at hand and I really want to do something about it because I know my future is in jeopardy. We want a clean DREAM Act with no funding for the wall and no taking out sanctuary cities or hiring more ICE agents,” said Bello. Marchers demanded Congress pass a clean DREAM Act and demanded legalization for all, recognizing their parents were the first Dreamers. The students also called for the renewal of Temporary Protective Status (TPS) for all status holders. In its relentless attacks on immigrants, the Trump administration announced Nov. 6 an end to Temporary Protective Status (TPS) for Nicaraguans and Sudanese immigrants, many of whom have lived in the U.S. for two decades. This decision will tear apart nearly 6400 more families, and strikes fear in the over 400,000 TPS recipients from countries such as Honduras, El Salvador, Haiti, Liberia and more. The Nov. 10 student walkout proved that immigrant youth are ready to fight against Trump’s vicious attacks. Students who walked out of their schools were joined by members of community groups and unions, such as the Minnesota Immigrant Rights Action Committee (MIRAC), Twin Cities Coalition for Justice for Jamar, SEIU Local 26, and many more.